ARE YOU PLANNING TO GET CERTIFIED IN 2018? Industry certifications can provide a professional edge over your competitors and demonstrate your commitment to education and training to the public. Now is the time to obtain a certification and take your career to the next level. 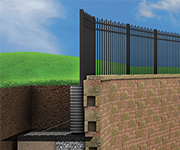 Certification exams for the Certified Fence Professional (CFP),Certified Automated Gate Operator Installer (CAGOI), and the Certified Automated Gate Systems Designer (CAGSD) will be offered at FENCETECH in Phoenix. Eligibility and application fees vary by certification. Please contact Cristina Rodriguez at 314-561-6625 or cristina@americanfenceassociation.com with questions. 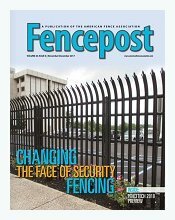 Your digital edition of the latest issue of Fencepost is available for your reading pleasure.This issue includes a FENCETECH 2018 preview, a feature story on security fencing, an economic outlook, and much more. Start reading today! 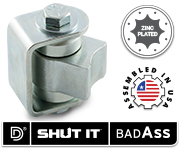 Did you include the Keynote in your FENCETECH registration package? You won’t want to miss remarks by Barry Willingham, President of Ameristar Perimeter Security USA Inc., an ASSA ABLOY Group brand. A highly regarded industry professional, Barry is well known in the fence, door and ornamental and miscellaneous metals industries and will bring fresh insights to his presentation on the synergies that can be achieved by related industries and their associations.Need to add this event or make other changes to your registration? Book your tickets to attend the Opening Party, sponsored by Southwest Automated Security, at FENCETECH 2018. You won’t want to miss out on an opportunity to connect with other industry professionals and enjoy great entertainment. Pack your dancing shoes and get ready to boogie along with tunes of the live band. Add the Opening Party to your FENCETECH registration or include it now when you register online. 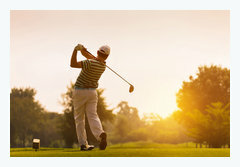 The AFA Education Foundation (AFAEF) invites you to participate in a golf tournament at FENCETECH, which helps to fund scholarships for students in the fence industry seeking higher education. You can also promote your business by sponsoring the event. Contact Brad Howard at (916) 257-6707 or bhoward@scsfence.com to discuss sponsorship opportunities. To register as a player, add the event during your FENCETECH Registration or download and submit the Golf Registration Form. 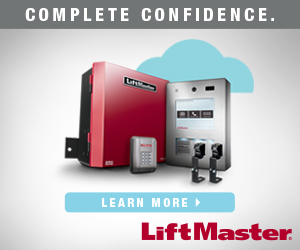 Want to save up to 40 percent on your business or home energy bill? Check out AFA's newest Member Savings Program provider, CEO ENERGY. Many states have deregulated energy and they can assist you to compare prices! See what you can save with our AFA INSTANT QUOTE option! 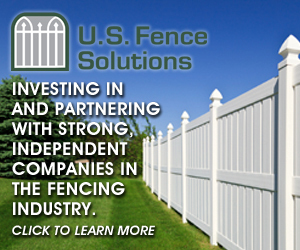 The American Fence Association extends its appreciation and congratulations to the following companies for celebrating milestone anniversaries with the association. Itochu (Itochu Corporation) has reached an agreement with E.R. Probyn Ltd. (Probyn), and Welco Lumber (Welco) to acquire all of the issued and outstanding membership interests of Alta Forest Products. Through this acquisition, ITOCHU aims to strengthen its fencing business in #NorthAmerica further, capitalizing on the expected synergies between Alta’s leading wood fencing supply position and Master Halco's leading sales and distribution network. 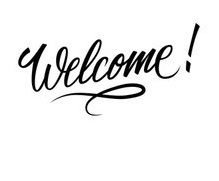 Southwest Automated Security is delighted to announce that we have expanded to open two new locations to better serve you. The first of which is in Columbus Ohio. Ryan Hanna is our Branch Manager and comes to us with years of experience. Going forward, SAS-OH will provide the same great level of customer service upon which, both he and we have built our respective reputations. The new Columbus office is located at 845 Claycraft Rd, Suite N. Gahanna, OH, 43230.